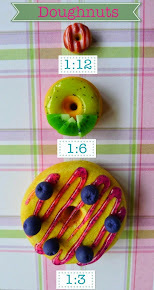 Since the animal doughnuts were best sellers, I decided to make new variants! I wanted to use new colours like blue and purple and include some popular characters (and turn them into yummy doughnuts). Each fluffy doughnut base is covered all over with sugar icing. Looks glossy and sweet! Our last new animal doughnut is the Japanese mascot - My Melody. My Melody is the Sanrio character that I love the most and it's her 40th Anniversary this year so I'm planning to model more items in her honour. I can't believe she is 40 years old! My favourite memories of childhood includes trips to Jusco (a Japanese shopping department) for My Melody stuff. The thick fondant sugar will be pastel coloured and written with red clear icing. Have your own Valentine's Day slogans on our heart cakes - just like Love Hearts sweets! Still tasted great! It's actually better than pretzel dogs (another food item I love)! Dolls should be able to enjoy this tasty snack as well so here they are. The ones in our shop are drizzled with some ketchup but you can also have mustard if you wish. Chinese New Year is coming up so I'd like to wish you Gong Xi Fa Cai! We also received a case of fresh juicy and sweet mandarin oranges. The fortune cookies and oranges are available in the 'Seasonal' menu. Bye and be sure to come back next week!